The correct title for the award often called the "Congressional Medal of Honor" is simply "Medal of Honor" and the men who have received it prefer to be called "Recipients" (of the award), not "winners". It is the only United States Military Award that is worn from a ribbon hung around the neck, and the only award presented "By the President In the Name of the Congress". 1Lt. Arthur MacArthur (Civil War) and General Douglas MacArthur (WWII) were the only father and son in history to each receive a Medal of Honor until the January 16, 2000 presentation of the Medal of Honor to Theodore Roosevelt. The award has been presented to 5 sets of brothers. Only one woman, Dr. Mary Edwards Walker (Civil War) has ever received the Medal of Honor. However an additional woman's name is on the Roll of Honor. During the Vietnam War Marine Captain Jay R. Vargas received the Medal of Honor. Before his award could be presented to him his mother passed away at home in Arizona. Vargas requested that his mother's name be engraved on the back of his Medal of Honor instead of his own. President Nixon honored that loving request and the name of M. Sando Vargas....Jay Vargas' mother...was added to the Honor Roll. Theodore Roosevelt is the only President to receive the Medal of Honor. The sons of TWO Presidents have received Medals of Honor: Webb Cook Hayes (Philippine Insurrection) and Theodore Roosevelt, Jr. (World War II). The first Medal of Honor ever presented was awarded by Secretary of War Edwin Stanton on March 25, 1863 to 19 year old Ohio Army Private Jacob Parrott. Parrott was a member of Andrew's Raiders, immortalized in the movie "The Great Locomotive Chase". Eventually Parrott's 18 fellow soldiers from that mission received Medals of Honor, 4 of them posthumously. All 19 of these heroes are from Ohio. As a civilian, James Andrews himself was not eligible for the Medal of Honor. The youngest person ever to receive the Medal of Honor was probably William "Willie" Johnston, who earned the Medal during the Civil War just prior to his 12th birthday and received his award 6 weeks after his 13th. The oldest recipient was probably General Douglas MacArthur who was 62 years old when he earned the Medal. World War II hero Jack Lucas became the youngest man in this century to receive the award when he threw is body over two grenades at Iwo Jima just 5 days after his 17th birthday. At the time of his heroism he had already been in the Marine Corps for three years. The last Medal of Honor action of the Vietnam War occured on Halloween night in 1972 when Navy SEAL Michael E. Thornton risked his own life to rescue his wounded team leader. His team leader, Navy Lt. Thomas R. Norris had been submitted for the Medal of Honor for his own heroic actions just 6 months earlier. It was the only time since the Korean Incursion of 1817 that a Medal of Honor was awarded for saving the life of a fellow Medal recipient. Mr. Norris did not receive his award until 1976. The brotherhood of Medal recipients is strong and generates many long-lasting friendships. Pvt. Jacob Parrott, the first person ever to be presented with the Medal of Honor remained such a close friendship with fellow "Raider" Wilson W. Brown (one of the two men who engineered The General in the "Great Locomotive Chase"), that their children became more than friends. Parrott's only son John Marion Parrott married Edith Gertrude Brown, one of Wilson Brown's eight children. It’s illegal to wear someone else’s Medal of Honor, but it’s not illegal to pretend you have one. 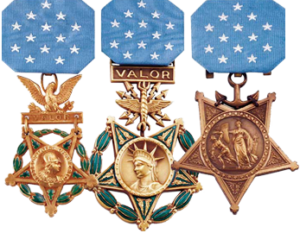 U.S. criminal law forbids the unauthorized wearing, manufacture and sale of military decorations, and misuse of a Medal of Honor carries a particularly heavy penalty. In 2006 President George W. Bush signed into law the Stolen Valor Act, which imposed a prison sentence of up to one year on anyone falsely claiming to have received a Medal of Honor. (Pretenders to other military decorations faced imprisonment for up to six months.) The Supreme Court struck down the act on June 28, 2012, ruling that it violated the right to free speech guaranteed by the First Amendment. Congress passed an amendment in 2013 to make it a crime for a person with intent to obtain money, property, or other tangible benefit, fraudulently holds oneself out to be a recipient of certain or medals. During World War I a total of 8 Marines received Medals of Honor. Two were Marine aviators of the 1st Marine Aviation Force. The remaining six were members of the 5th and 6th Regiments of the 2nd Division, working closely with their Army counterparts. Five of the six received both the Army and Navy Medals of Honor for the same deed, with a separate citation from each branch of service. The remaining 14 heroes received two awards for two separate actions. The military incidents were prior to World War I. Since the reviews and changes of 1917 the laws governing award of the Medal of Honor have ended all double awards of the Medal of Honor. A soldier may be nominated repeatedly for the Medal of Honor, indeed during the Vietnam War Special Forces hero Robert L. Howard was submitted for the Medal of Honor three different times before he was finally awarded the Medal.